DVD to Mobile Phone Converter, best Video Converter for your Mobile Phone. 3herosoft DVD to Mobile Phone Converter is a powerful and easy-to-use DVD to Mobile Phone Converter which helps you fast rip and convert DVD to 3GP, 3GPP, MP4, AVI, WMV video formats and WMA, MP3, AAC, M4A audio formats for playing on Apple iPhone, iPod, iPad, Sony PSP, Palm, Pocket PC, and various brands of cell video phones including LG, Motorola, Nokia, Samsung and Sony Ericsson and so on. Compared with other DVD to Mobile Phone converter software, 3herosoft DVD to Mobile Phone Converter has more powerful editing functions for you to customize video and audio quality of your own. Before converting DVD to Mobile Phone, you can adjust output video effect, trim any part of DVD and specify the output settings, select target subtitle and audio track, and so on. Turn your mobile phones and players to portable movie theater and enjoy your DVD movies on your mobile phones and players with 3herosoft DVD to Mobile Phone Converter! Now free download and try this powerful DVD to Mobile Phone Converter software and colorize your digital entertainment life. 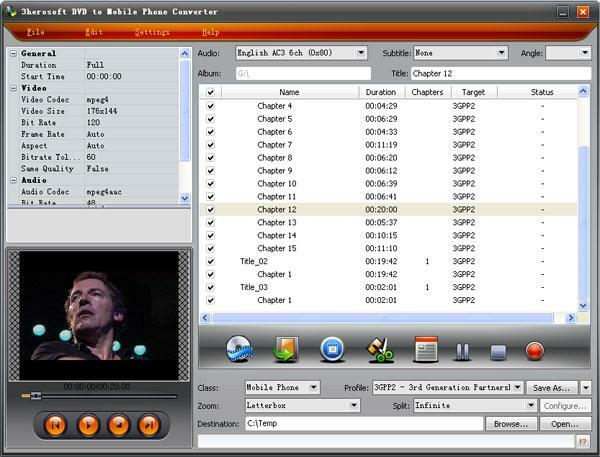 Easily convert DVD to Mobile Phone video formats including 3GP, 3G2, MPEG-4, H.264/MPEG-4 AVC, WMV, AVI. Rip DVD movie to AAC, MP3, M4A, WMA, MP2, and WAV for playback on your mobile phone. The converted files can be played well on Apple iPhone, iPod, Sony PSP, Palm, Pocket PC, and various brands of cell phones including LG, Motorola, Nokia, Samsung, Sony Ericsson and more. Trim any parts of DVD movie by setting start time and end time or by dragging the start slider and the end slider to clip the desired segment. This DVD to Mobile Phone Converter provides more video and audio settings for you to adjust, such as video resolution, video bit rate, frame rate, codec, audio channels, sample rate, etc. to get high image and sound quality. Select the subtitle and audio track according to your need, and rip DVD to Mobile Phone with changeable language you prefer. Download DVD info from Internet automatically while loading DVD to software, so you are able to add more information like film title, actors/actresses, chapter titles, scene names and more. Multithreading and batch conversion provide super fast conversion speed due to multi-core CPU support. Faster than any other DVD to Mobile Phone converter. User-friendly interface without any complicated settings. Rip DVD movie to Mobile Phone with just a few clicks.